AMD power? Asus is constantly increasing its Eee PC range. Now the Taiwanese company has also ventured a try basing its smallest series' member on AMD. The 10 inch netbook is available with the entry level APUs, AMD C-30 or C-50 including the incorporated AMD Radeon HD 6250 for the graphics unit (DirectX 11). Price: starts at 250 euros. Is the attempt worth it or should you continue to rely on Intel netbooks? There were many rumors about the Asus netbook with an AMD heart. 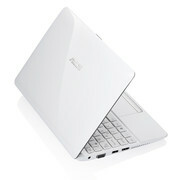 The Asus Eee PC 1015B had its debut at the Consumer Electronics Show 2011 (CES). The 10 inch notebook is based on the AMD Brazos range, just like its bigger, 12 inch brother, the Asus Eee PC 1215B (previously reviewed). The Eee PC 1015 model can be equipped with either the AMD single core APU C-30, C-30 (1.2 GHz) or the dual core model, C-50 (1 GHz). The more expensive alternative, which we reviewed, even comes with a USB 3.0 port and Bluetooth 3.0 +HS. That is quite unusual in the price range of just under 300 euros. AMD's graphics chip, Radeon HD 6250, is concealed by the familiar seashell case. It even supports DirectX 11. The graphics performance is to especially benefit from the Fusion Accelerated Processing Units. The bundle is rounded off by a 250 GB Western Digital hard disk and a 1 GB DDR3 RAM. Asus still relies on a matt screen. Find out in the following review what the netbook really can accomplish and where it is positioned in comparison to the Intel models. There are many colors to choose from. 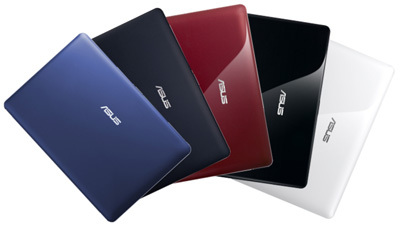 The Asus Eee PC 1015B is available in the most various colors. The customer has to choose between black (matt and glossy), white (matt), red (matt) and blue (matt) designs. Except for the stickers, nothing really worth mentioning has been modified on the familiar seashell case. Here is a summary of the most important data. The case is made of plastic and is quite stable. It only yields slightly under pressure. The matt surface doesn't provide room for fingerprints and dust. The display hinges have a firm grip on the screen. Twisting is almost impossible. The overall workmanship is of very high quality. The 10 incher is a very portable device, as it should be for netbooks, with dimensions of 36.4 mm x 262 mm x 178 mm and a weight of not quite 1300 grams. 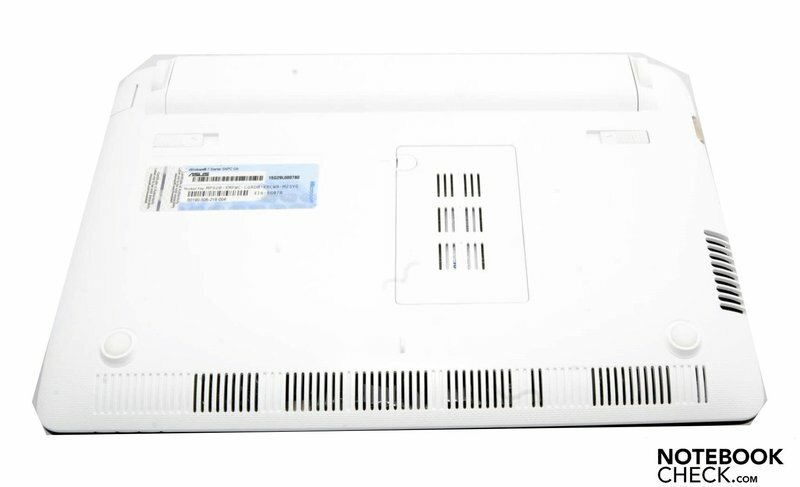 The Asus Eee PC 1015B's interfaces are located only on the netbook's left and right. In addition to two USB 2.0 ports, a fast USB 3.0 port has also been installed. That is still unusual among netbooks. It also stands out from the other ports due to its blue color. In addition to the VGA socket, there is also a HDMI interface available for connecting the netbook to larger monitors. We only miss an eSATA port. A 0.3 megapixel webcam with privacy cover has been built into the display bezel. You can't expect much from the small recording device, but it should be sufficient for short video conferences. The Asus netbook has multiple communication options. As already mentioned, the Eee PC has a gigabyte LAN port. The device is also capable of communicating wirelessly via the currently fastest WLAN standard, 802.11 b/g/n. Even the newest Bluetooth version, 3.0 +HS, is built into the netbook. The system merely lacks a UMTS module, but can be retrofitted with an external module. The Asus Eee PC 1015B's scope of delivery is scanty as unusual. Besides the netbook and power adapter, there is only a bit of printed material, such as the manual, in the small box. There are simply no extras possible in this price range. Asus offers a factory warranty of 24 months for its Eee PC 1015B. But it is is only valid for 12 months on the battery. The warranty includes a pick-up & return service for Germany & Austria. The warranty can be extended by 12 months for a surcharge of just under 60 euros. The warranty extension also includes the pick-up & return service. Comparing the chiclet keyboard with the predecessor's, there has been no changes. The keyboard is still ergonomic. The pressure point and the key drop of the 14x14 millimeter small keys have been pleasantly selected. Nothing's changed on the shift keys, either. They are still too small to be used comfortably. 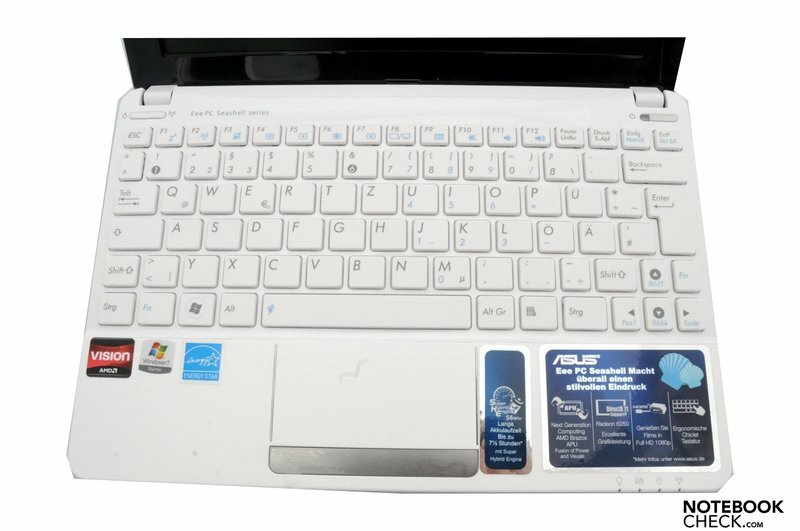 However, Asus could have left out the second FN key, above the right arrow key. There have also been no modifications made on the touchpad when compared to the previous models. It still supports multi-finger gestures and has good gliding traits. The touchpad's diagonal is about 8.7 cm. A long silver bar is installed as the mouse replacement key. This key solution needs a bit more force than usual until the click has been detected as such. The invisible border between the left and right key is also annoying. The Asus Eee PC 1015B is equipped with a netbook typical 10.1 inch WSVGA display. The matt screen from the Taiwanese manufacturer, HannStar, achieves a maximum native resolution of 1024x600 pixels. The Eee PC has to use an external monitor to provide higher resolutions. It has both a VGA and HDMI port available for this. 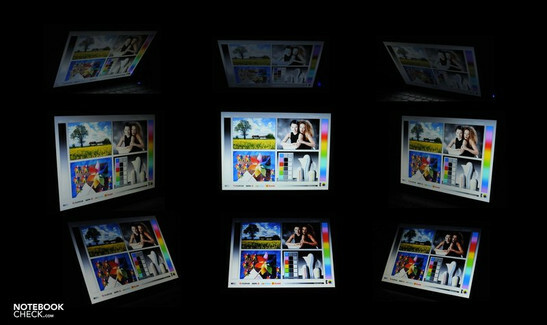 The 25.7 cm (diagonal) anti-glare type display with the model label, HSD03E9, is illuminated with LEDs. The assessed black value of 0.36 cd/m2 is very low. This results in a high contrast of 828:1. The test device's brightness is agreeably high. The display achieves an average of 284.4 cd/m2 and is thus considerably brighter than its big brother, the Asus Eee PC 1215B (average: 182.1 cd/m2) with a glare type display. We even selectively measured a rate over the 300 mark with Gossen Mavo Monitor. The illumination of 81 percent is acceptable because only one measuring point falls through the cracks with 246 cd/m2. A netbook is made for mobile use. Thus, the display also has to be accordingly suitable for outdoor use. This is also the case in the Asus Eee PC 1015B. At first, nothing is reflected thanks to the matt display. Moreover, the brightness is high enough to even use the netbook outside of shadows. Thus, there shouldn't be much in the way of using the Asus Eee PC 1015B outdoors. The Taiwanese manufacturer completely relies on AMD for its B edition of the Eee PC 1015. The heart piece is either the AMD C-50 dual core APU or the single core processor, AMD C-30. Our test sample is equipped with the dual core APU. The processor comes with a clock rate of 1 GHz per core. The dual core processor's TDP is specified with 9 watts by the manufacturer. However, not only the processor hides behind the accelerated processing unit, codenamed Ontario. A feature of the APU is an absolutely different component: the graphics unit. The Radeon HD 6250 graphics card with a core clock of 280 MHz is also on AMD's C-50. It supports DirectX 11 and is a lot stronger than Intel's GMA 3150 in Atom processors thanks to 80 shaders and a UVD3 video processor. The bundle is rounded off by a 1024 MB DDR3 RAM and a 250 GB Western Digital hard disk. The processor first had to prove itself in the software, Cinebench R10. The system achieved 695 points in rendering on one core in the 32 bit version, and reached 1336 points on two cores. 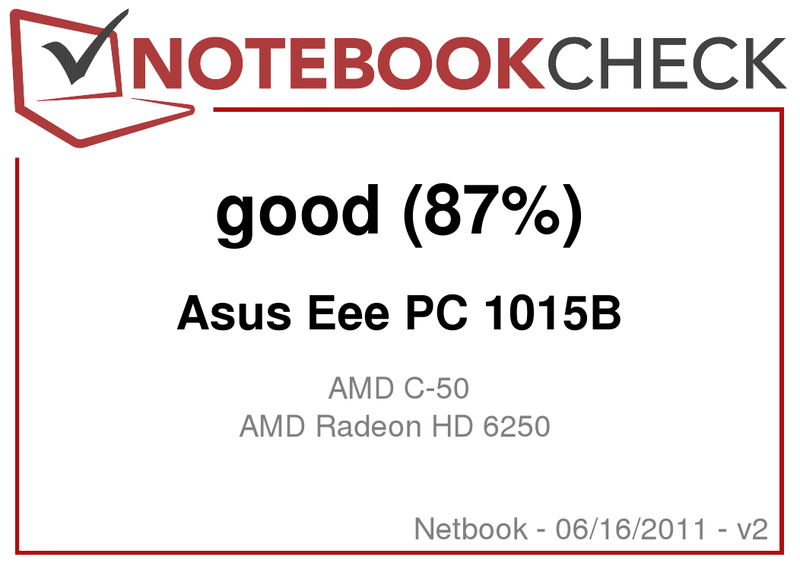 The previous model, Asus Eee PC 1015PEM (1504 points) with Intel's Atom processor N550 (1 M cache, 1.50 GHz) doesn't do much better. However, it already becomes obvious here that the AMD C-50's strength is not found in processor performance. We couldn't test the 64 bit version of Cinebench R10 and Cinebench R11 on the Asus Eee PC 1015B because the device is only delivered with the Windows 7 Starter Edition. The results should be about the same as those of the Asus Eee PC 1215B, though. The graphics performance of the Asus test device is especially interesting because the system could only score with the Radeon HD 6250 graphics card. We tested the graphics chip with the benchmark software, 3DMark from Futuremark. Only the 3DMark05 version didn't want to start on our test device. A possible cause might be a driver problem. The Asus Eee PC 1015B supplied a proud 1460 points in 3DMark06. That is top in the netbook range. With 147 points in 3DMark06, the Asus Eee PC 1015PEM model with Intel's Graphics Media Accelerator (GMA) 3150 only achieves a fraction of the Asus Eee PC 1015B. The system reveals its true strength here. Nevertheless, the system is not suitable for the latest computer games. A netbook is simply just not made for that. We also checked the application performance with software from Futuremark. Both PCMark Vantage and PCMark 7 were use in this case. The benchmark tool, PCMark Vantage, had a few problems and couldn't run all tests. Thus, the rates are to be taken with a pinch of salt. The Asus netbook is on a par with the other Eee PC range members here with 1345 points. 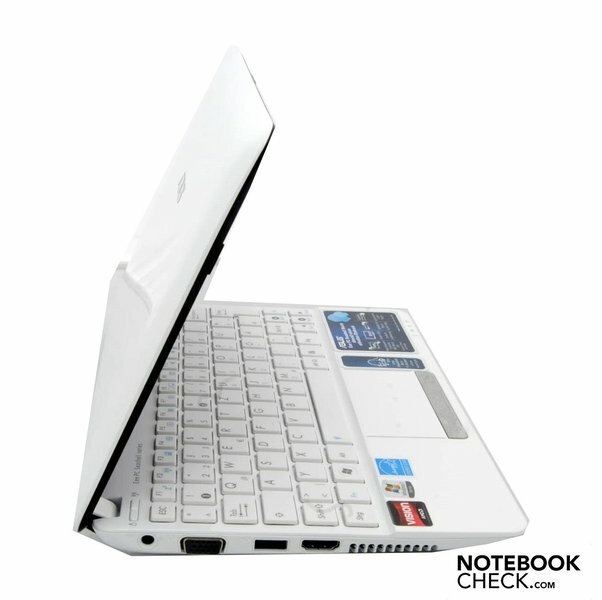 The Asus Eee PC 1015T netbook is its immediate neighbor with 1360 points. 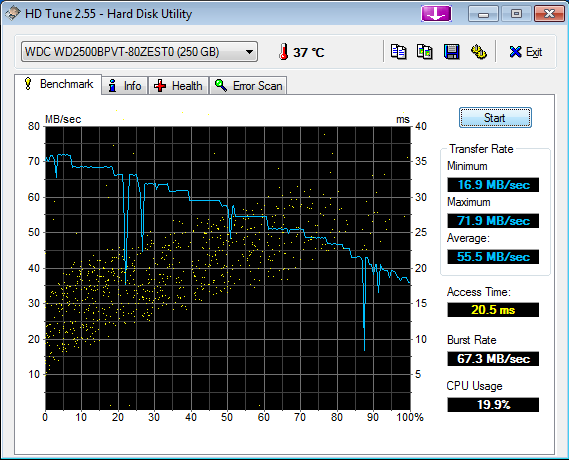 We looked at the hard disk's performance with HDTune. About 250 GB have to suffice as memory capacity in the Eee PC. This is how much the Western Digital hard disk has to offer. The hard disk in a 2.5 inch format, with the model label WDC WD2500BPVT-80ZEST0, rotates at 5400 revolutions per minute. The rates assessed with HDTune and CrystalDiskMark aren't exactly awesome. According to HDTune, the Asus system manages an average transfer rate of meager 55.5 MB/s. Only exchanging the disk can help here. An SSD would be a good alternative. The Asus netbook works very quietly in both idle as well as during load. The installed little fan is hardly audible. The difference between full load and idle mode is only just 2.4 dB(A). The Asus Eee PC 1015B achieves a maximum of good 34.3 dB(A). It's just a bit under 32 DB(A) in office mode. The Asus system can score here, as usual. The low heat development definitely belongs to the netbooks advantages. They hardly differ during load (average: 29.4 degrees Celsius) from those during low load (average: 28.3 degrees Celsius) on the top. The maximum temperature is only 31.4 degrees Celsius. The bottom gets a bit warmer. The average is however still a good 34.8 degrees Celsius here. There is no reason for complaint should the system not only be used on the desk. (+) The average temperature for the upper side under maximal load is 29.4 °C / 85 F, compared to the average of 29.8 °C / 86 F for the devices in the class Netbook. (+) The maximum temperature on the upper side is 31.4 °C / 89 F, compared to the average of 33 °C / 91 F, ranging from 21.6 to 53.2 °C for the class Netbook. (+) In idle usage, the average temperature for the upper side is 28.2 °C / 83 F, compared to the device average of 29.8 °C / 86 F.
(+) The palmrests and touchpad are cooler than skin temperature with a maximum of 30.3 °C / 86.5 F and are therefore cool to the touch. (±) The average temperature of the palmrest area of similar devices was 29.3 °C / 84.7 F (-1 °C / -1.8 F). Two stereo speakers are available for sound rendering. They couldn't impress us, though. The speakers provide very dominant trebles. The deep pitches are almost completely absent. You get the standard poor netbook quality in this case. Only external speakers can help here. They can be connected via the headphone out or the HDMI port. The range between the minimum and maximum battery runtime is generally not exactly vast. 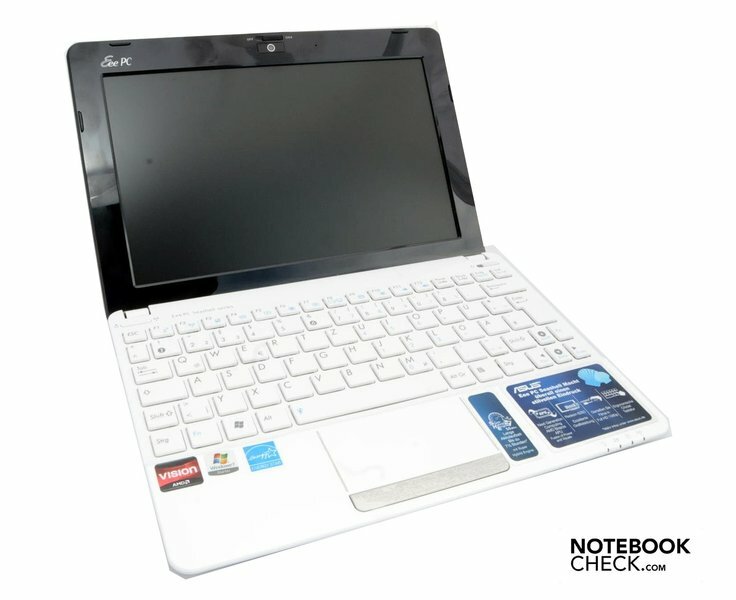 The Asus Eee PC 1015B reached 7 hours and 15 minutes in BatteryEater's Reader's test. The brightness and performance is reduced to the lowest possible level and functions, such as WLAN, are disabled for this. The netbook lasts approximately just as long in WLAN mode during practical use, as well. The 6 cell battery is good for 6 hours and 25 minutes here. We put the Asus netbook under load with the Classic test (high performance profile). The Asus Eee PC 1015B quit after 3 hours and 37 minutes in this test with its 56 watt hour lithium ion battery. The battery capacity is especially pleasing in full load, although other netbooks last considerably longer in idle mode. Compared to the Asus Eee PC 1015PN, the power consumption is lower. As you might assume from the battery's performance, the power consumption during load (Prime95 + Furmark) is about twice as high as in idle mode. Consequently, Asus' system consumes a remarkable maximum rate of 19.6 watts. Overall, the rates correspond to the measured battery runtimes. AMD advances into the netbook market and proves to be very dangerous for the up until now unrivaled chip manufacturer, Intel. However, AMD isn't at the forefront with its APUs yet. Alike the previous models, the Asus Eee PC 1015B's case convinces. The battery life of about 6.5 hours in use is only average for a netbook. The Asus system can clearly score with its AMD Radeon HD 6250. Also, a USB 3.0 and HDMI port is still a rare thing among netbooks. There is nothing standing in the way of an outdoor use with the matt screen and high brightness, either. Moreover, the low heat development and the quiet operating noise have to be mentioned positively. The Eee PC has only lost marginally with its dual core APU C-50 compared to the Intel models in terms of processor performance. But it is the right direction. It will definitely not be the last netbook from the Eee PC range based on AMD's APUs. 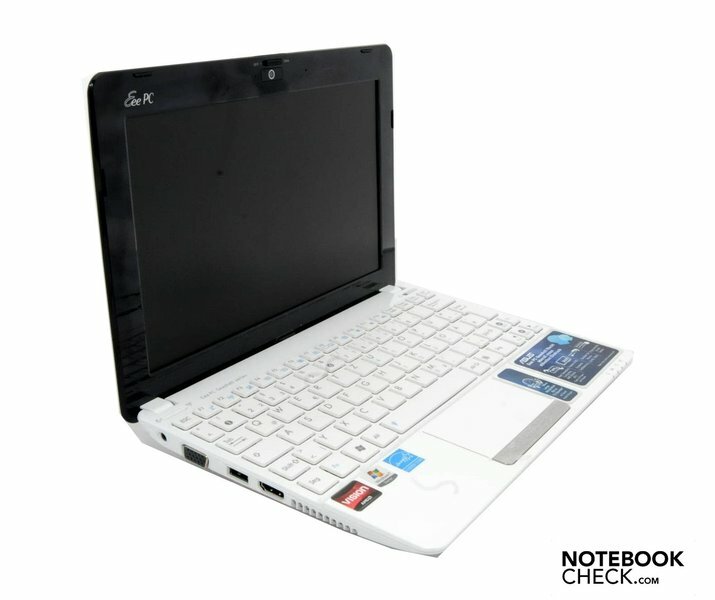 The customer gets the known Eee PC quality with somewhat weaker processor power, but many other strengths for about 300 euros. 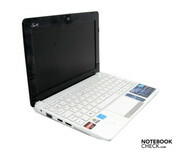 The Eee PC 1015B is quite portable with dimensions of 36.4 mm x 262 mm x 178 mm. Asus bids an international warranty on its netbook. Asus still relies on the seashell case. The keys have a size of 14x14 millimeters. The six cell lithium ion battery has a capacity of 56 watt hours. The display hinges have a firm grip on the screen. Used once again: the chiclet keyboard. The extendability isn't exactly excessive. The Super Hybrid Engine is of course also included again. It's called AMD power on the netbook. The maximum opening angle isn't exactly wide in the Asus model. The familiar Eee PC quality with strong GPU performance. A better battery performance would even increase the Eee PC 1015B value.